A reasonably-priced 4K monitor with an attractive design, fast response time and decent image quality once you've calibrated it or fiddled with the settings. The emergence of new technology is usually accompanied by high price points and a lack of choice, requiring deep pockets and the patience to put up with exciting, but often flawed first efforts. Most 4K monitors are still very expensive, but efforts by manufacturers to bring down prices means that they are now able to put out models catering to different use cases, striking a balance between features and quality in a bid to bring the technology to wider adoption. A case in point, Samsung's 28-inch U28D590D makes compromises in just the right areas. Relatively affordably priced at £429 ($679, or AUS$782), it is being aimed at gamers, media consumers and productivity-conscious users thanks to its 3,840 x 2,160 pixel resolution, which is four times that of a regular 1080p monitor. There is an ever-increasing number of competing models at this price point, which include Acer's XB280HK (£499) that features Nvidia' frame synchronising G-Sync technology, AOC's U286PQU (£399), and Asus' PB287Q (£450). Additionally, if you think that 28 inches may be too big for you, Dell offers an impressive 24-inch 4K monitor in the UltraSharp UP2414Q. 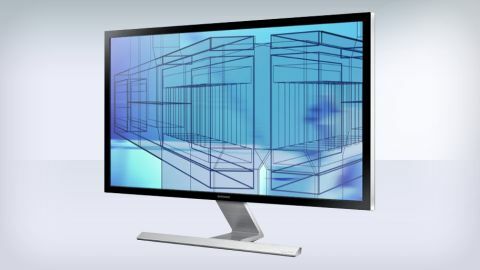 It's easy to see the U28D590D appealing to fans of minimal monitor design, with Samsung keeping things simple in just about every area - from design to setup and calibration. The black bezel that surrounds the panel is thin and unobtrusive, with the only decoration being a silver Samsung logo along the bottom. The stand is made of a sturdy aluminium construction and is both light and durable. It also allows the U28D590D to be set up quickly and easily as it's the only other part (other than the panel itself) that you'll find in the box. The stand connects to the monitor using two screws, meaning you'll need your own screwdriver to hand as one isn't supplied. The monitor can be tilted forwards and backwards by around 15 degrees, allowing you to face it downwards slightly if you place it on books or another surface for elevation. Unfortunately you'll have no choice but to do so in the absence of an adjustable height stand. You can't rotate it left or right either without moving the base. You'll have no trouble accessing the UD90's ports because they're conveniently located at the centre of the monitor's rear. Embedded in a slightly recessed part, they're easily accessible and allow you to connect and remove cables with minimum effort. There you'll find two HDMI ports, a DisplayPort and a headphone output jack. Such port placement, while convenient, means that it would be very difficult to wall mount the display - so it's just as well that Samsung hasn't given you the option - there are no VESA mount holes here. If you're looking to pin your gaming battle station's display onto the nearest wall, the U28D590D isn't a suitable choice. Menu controls are operated using a five-way joystick found on the bottom-left hand corner on the display's rear panel. We've seen similar menu control methods employed on monitors such as LG's UM3495 to good effect, and it works well once again here, providing the dual benefit of ease of use while remaining tucked out of sight. Pushing it up, down, left and right will take you to other menus, while depressing it is used to make selections. I find this a much preferable option to fiddly touch-sensitive controls that can fail to register presses on some monitors, but those who frequently switch inputs or change aspects such as brightness and volume may still prefer physical front-facing buttons. The U28D590D has a TN panel, which means that while viewing angles are good, they're not great, and are noticeably weaker than what you would usually find on more expensive IPS variants. Out of the box, brightness was almost blinding, as if the monitor had been pre-configured to compensate for slightly off colour saturation. While incredibly bright, colour saturation and vibrancy was lacking and required calibrating. TN has long had the reputation of producing poorer colour saturation and inferior viewing angles to IPS, but such displays have improved in recent years and the U28D590D looks anything but cheap once properly calibrated. Using our Spyder4 Elite calibrator, it was possible to correct the colour saturation and adjust contrast and brightness to appropriate levels. Post-calibration, colours appeared bolder and more accurate, with 4K test wallpapers showing deep blacks and vibrant colours that "pop". Gaming on a 4K monitor can be an absolute treat, but you will need a monster rig to game at the resolution with anything approaching acceptable frame rates. We fired up Skyrim on a full-specced MacBook Pro with Retina connected over HDMI. Although frame rates were choppier than a steamboat in a storm (and limited to 30hz due to the limitations of HDMIv1.4), the picture quality was nonetheless highly impressive, packing incredible amounts of detail and producing no noticeable ghosting thanks to the monitor's low 1ms response time. To play at full 60hz you'll need to use DisplayPort in conjunction with hefty amounts of raw computing power. Another "disadvantage" of 4K is that Windows 8.1 suffers from scaling issues and inconsistency in rendering text and UI elements. Fonts in particular can be very hard to read in certain applications - such as Google Chrome. The U28D590D is no different, meaning you'll have to dedicate some time to adjusting the Magnifications setting in Windows to strike a balance between legibility and having sufficient desktop real-estate. Once you've carried that out to satisfaction, you'll find that there's ample room for snapping documents side-by-side, watching movies with breathtaking detail and clarity and closing applications less frequently.